Inbound Marketing, Revised and Updated: Attract, Engage, and Delight Customers Online is a comprehensive guide to increasing online visibility and engagement. Written by top marketing and startup bloggers, the book contains the latest information about customer behavior and preferred digital experiences. From the latest insights on lead nurturing and visual marketing to advice on producing remarkable content by building tools, readers will gain the information they need to transform their marketing online. The book also contains essential tools and resources that help build an effective marketing strategy, and tips for organizations of all sizes looking to build a reputation. When consumer behaviors change, marketing must change with them. 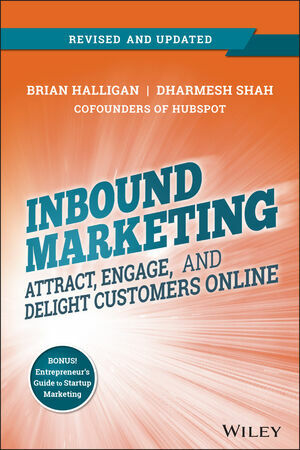 The fully revised and updated edition of Inbound Marketing is a complete guide to attracting, engaging, and delighting customers online. BRIAN HALLIGAN is cofounder & CEO of HubSpot, an inbound marketing and sales software company that helps businesses transform how they get found and grow online. Brian also teaches Entrepreneurial Product Development and Marketing as a Senior Lecturer at MIT. Connect with Brian on Twitter @bhalligan. DHARMESH SHAH is cofounder & CTO of HubSpot and an angel investor in over 50 technology startups. Dharmesh also authors OnStartups.com, a popular startup blog with over 400,000 members in its community, and is a frequent speaker on the topic of startups and marketing. Connect with Dharmesh on Twitter @dharmesh.